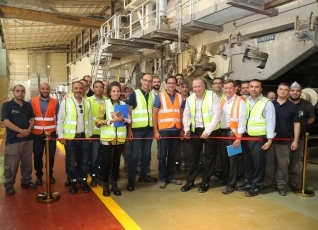 Fine Hygienic Holding celebrated the renovation of its Al Keena Paper Mill with company employees in Jordan. The mill produces facial tissue, toilet and towel tissues, table napkins, and folded hand towel, in addition to baby diapers. Aug. 27, 2018 (Press Release) - Fine Hygienic Holding (FHH), one of the world's leading manufacturers of hygienic paper products, recently completed a comprehensive repair and renovation of its factory and machinery at Al Keena paper mill in Jordan. This careful and comprehensive process not only ensures the machines will continue to run smoothly for years to come, but also guarantees that the factory will continue producing the same high quality paper products that consumers have come to expect from Fine. The factory, which had slowed operations during the renovation process, returned to full capacity with a ribbon cutting ceremony, attended by FHH's CEO James Michael Lafferty, senior members of the group, and Al Keena staff. The ceremony was proceeded by a tour of the facilities, and a final inspection of the extensive array of machinery at the factory. The Al Keena mill has a total tissue capacity of about 45,000 tons per year and total diaper capacity of about 378 million pieces per year. The mill produces facial tissue, toilet and towel tissues, table napkins, and folded hand towel, in addition to baby diapers. Established in 1958, Fine Hygienic Holding is the largest hygienic tissue and diaper producer in the MENA region (Middle East and North Africa). To learn more, please visit: www.finehh.com.